FREE Mailing List May Giveaway! Mine was absolutely one for the books–weather wise for sure! We are being blessed with some of that Florida weather they brag about in the AAA commercials and I am taking in every moment before it literally MELTS away! On top of that–my backyard smells like a floral shop. I have Confederate Jasmine, Gardenias, Roses,Hibiscus in both tangerine and tanzanite, Hydrangea AND and Crepe Myrtle! I am clipping and cutting and savoring every single bloom ’cause I know June is just around the corner and the Florida heat will cause these beauties to take cover–just like it does to ME! The restful weekend was good for me since the month of May is going to be filled with lots activity! I have a new Summer Bible Study forming! I would love to have you join us. All you have to do is go to Facebook, look for the GROUP “A Summer Pause”, ask to be invited into the group and just that simple, you are IN! We are going to to be chatting about the INFLUENCE of a Woman using some familiar and some not so familiar women from the Bible as our chatter fodder. 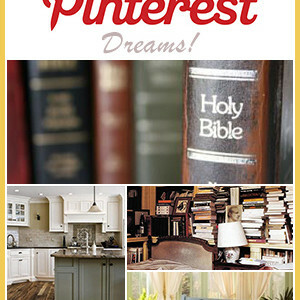 It is simple fun but keeps us in God’s Word together during the busy months of Summer. 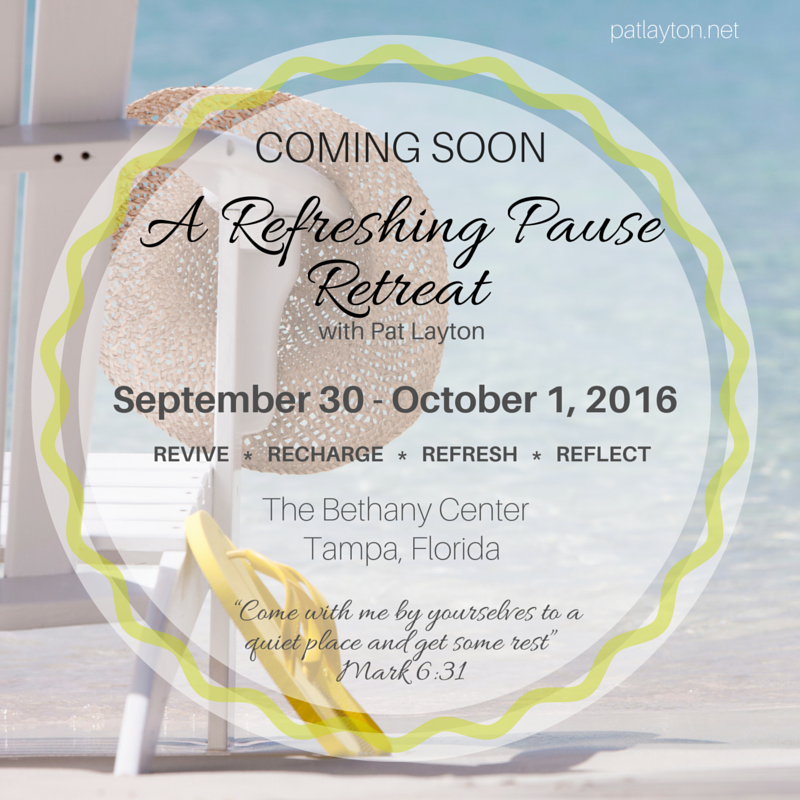 I am hosting a Fall Retreat (YEAH!!!) right here in beautiful Tampa, Florida and would love to have you join me! I am inviting a few girlfriends (25 is the MAX!) 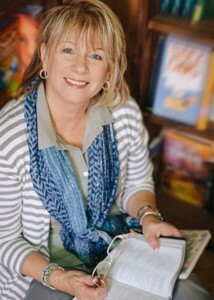 from near and far to talk about writing, ministry and just plain living Life Unstuck! For more information — be sure you are on my mailing list by signing up on the home page of my website!! I’ll be sending more information very soon. I hope you will pencil in the date! 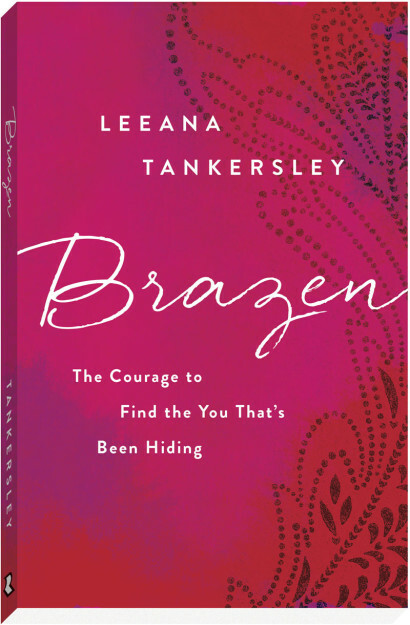 How about THIS BOOK from my sweet friend Leeana Tankersley? Here is what YOU HAVE TO DO for a chance to win the book! 1-SHARE this post on Instagram, Facebook or Twitter and tag ME!! 2- Leave a Greeting RIGHT HERE on my BLOG!! 3-Be on my EMAIL List! Sign up on the homepage of my website! If you are not receiving my News Update Emails or my Monthly Newsletter A Refreshing Pause, I would be honored to have you join us! I release a newsletter on the FRIST FRIDAY of each month filled with lots of seasonal ideas, great book releases and SIZZLING HOT news from my own ministry. PLUS — those special friends get DOUBLE CHANCES at all my FREE STUFF!! I love getting to know you better and hearing more about your struggles as well as your celebrations! Previous Post: « Take Hold of the Faith You Long For! Guest Blog! I had a wonderful Sunday. Church and then dinner with my husband and two sons. They make me laugh. Came home to a nap with a cat and a dog in my lap. Woke up to three cats and a dog in my lap. I am mom to all. Thank you Mary Jane! I missed the nap but the critters were everywhere at my house as well!! Certainly enjoyed meeting you at the Calvary Unstuck conference. I look forward to more conversations as we can. Still working towards the Life Coaching goals that we discussed. That weekend was AWESOME! I loved every minute and loved meeting new friends like you! Stay the course new friend! The description if all the wonderful smells in your back yard was decadent. We have star jasmine here. It’s lush. The Summer heat is coming to take away my blooms in Lancaster, CA too. Blessings Pat. Star Jasmine! Sounds yummy! I’ll have to look that up. Hi Pat, I love hearing from you and I would love to be a part of your September gathering of girlfriends. I would LOVE–LOVE that!! I think you are on my mailing list already right? You receive the newsletter? I will be sending something out in the next week or so!! Had a fantastic weekend fishing on the lake with my kids, even caught a few. Then sat on the patio til it was so dark we couldn’t see each other anymore talking about life, God, our struggles and silly sloth you tube videos. Blessed Mother’s day! OMG–My very favorite moments—sitting until you cant see each other any more!!!! 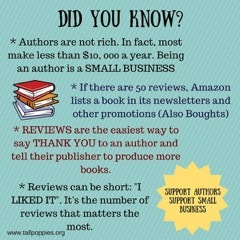 Your friend’s book sounds amazing! That, together with Life Unstuck will help me with my new blog. Thanks, Pat! I am so tirelessly trying to find the “me” that God intended me to be! It is a daunting task full of fear and disappointments along the way, but will be SO worth it when I find who HE wants me to be! I’m so glad to find your blog and read your daily posts! 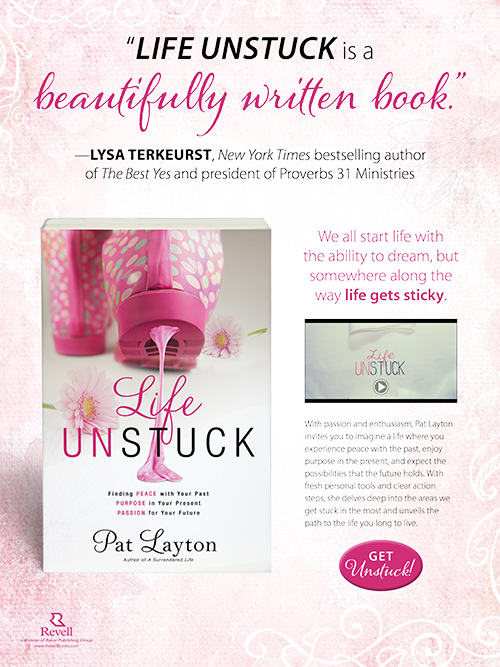 I purchased your book “Unstuck” and look forward to reading it. May God richly bless you! !